Field Marshal Montgomery Pipe Band are to receive the 2018 Special Award as part of TG4’s traditional Irish music awards, Gradam Ceoil. 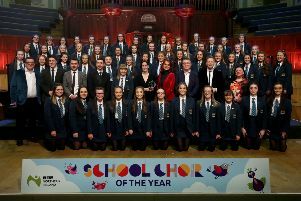 The Lisburn-based band will be presented with the award at the Gradam Ceoil concert and awards ceremony at Belfast Waterfront on Sunday, February 4, which will be broadcast live on Irish language channel TG4. Widely regarded as the Oscars of Irish music, the Gradam Ceoil ceremony is making its first visit to Belfast in the awards’ 21-year history. As well as gaining World Champion status 11 times, Field Marshal Montgomery Pipe Band have held more than 20 All-Ireland titles. They have also produced four highly successful albums to date, bringing traditional music to audiences across the world. The band is led by Killyleagh man Richard Parkes MBE, a multi-award-winning piper who has held the position of Pipe Major since 1981. Throughout his career, Richard has won seven All-Ireland Senior Solo Championships, eight Northern Ireland Piper of the Year titles, nine Ulster Senior Championships and a number of other senior solo competitions across the UK. He was awarded the MBE by Her Majesty The Queen in 2004. Under Richard’s artistic direction and leadership, the band has expanded their repertoire and innovated in the arrangement of traditional music for pipe bands, and remains committed to the inclusion of new compositions. On hearing that the band is to receive the Gradam Ceoil award, Richard said: “It’s an honour to be recognised by our peers through this award, particularly because the standard of traditional music is so high. We’re overwhelmed. A total of seven awards will be given out at this year’s TG4 Gradam Ceoil concert and awards ceremony, with other winners including: Frankie Gavin, Musician of the Year; Clare Friel, Young Musician of the Year; Patsy Hanly, Lifetime Achievement Award; Máire Ní Chéilleachair, Singer of the Year; Pádraigín Ní Uallacháin, Special Contribution Award; CONCERT, Musical Collaboration. Tickets for the TG4 Gradam Ceoil 2018 Awards, priced £25 (£22 for concessions), are available from www.waterfront.co.uk or by calling 028 9033 4455. The concert will be broadcast live on TG4 from 9:30pm.